#1866 # 4 - The calm before the storm!! First time I ever saw a black guy and a white girl kissing in public I was on a bus stop and I could not stop staring. I'd seen that on movies and tv, of course, but alive it looked much more intense. That couple was very contrasting because he as very dark and thuggish, while she was blonde, beautiful and looked like an upper class girl. When they noticed I was staring at them they stopped and started laughing at me, plainly mocking me. And next, they just went on, defyingly. I felt terrible and wished I could disappear, but my bus took long to show up. When I got home at night I masturbated to that vision. This is how my kink about interracial kissing and interracial relations has started. 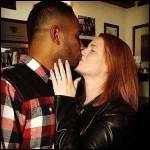 Later, in college, I started fantasizing about watching my white girlfriend with a black guy ... and eventually, I made it happen! Now we're married and she has a steady black boyfriend. Congratulation. Your story is damn hot. I masturbated by reading. 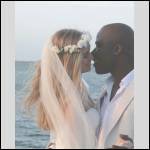 I also love to see a black man and a white girl or a woman kissing. Sometimes full of tenderness and sometimes greedy.